4" embroidery scissors. Fine sharp point ideal for close work in small areas. CAUTION: As in most .. This back mount accessory is original and in very short supply.Fits the following Singer sewing mach..
A Great addition to G-8. 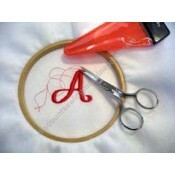 Unique comfortable design, ideal for close work; embroidery, thread trimmin..
High quality oil in refillable extendable spout. 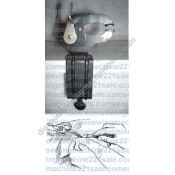 Long neck spout style of oiler #NK2 may vary depend..
Automatic Zagzagger with cams. 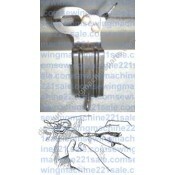 Fits most 301 and other Singer slant needle machines.Alternate Part N.. PLEASE NOTE: This is pictured with a top to the box, however this is our last one and it does NOT ha.. Fits 301 and other Singer slant needle machines. Box and instruction book. 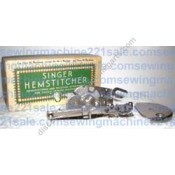 Also #86649 for 221 Feath..
Singer darning and embroidery attachment complete with plate, foot, instruction booklet and box with..
For Featherwieght 221 and other vertical needle machines. Comes with box and reprint manual.Fits th.. Original rare to find in this good of a condition. 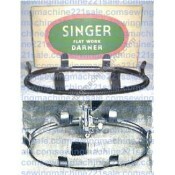 Singer flat work darner and free motion hoop. 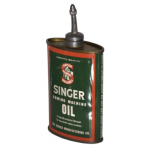 F..
Singer gripper (silver in color). This is a newer style, when attached to the edge of the table it ..
Singer gripper (black in color). We added some new green felt. 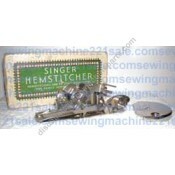 This is an older style gripper which..
Singer hemstitcher and picot edger #121387 comes with plate #121389 which is for Singer models 99 cl..
Singer hemstitcher and picot edger #121387 comes with plate #121073 (121389) which is for Singer mod..